A friend asked if there was a way in Photos to see which albums a selected photo had been added to. This is one of those things that would be incredibly easy for Apple to provide: Select a photo, press Command-I, and in the info window, you could see a list of all albums containing the selected photo. As you can see, the album used for the search is included in the results; someone with better AppleScript skills than I could probably modify the script to exclude that album (any takers?). While I’d much prefer Apple include this feature directly in Photos, at least there’s an alternative when you need this information. Here’s the script in case the source ever goes away. 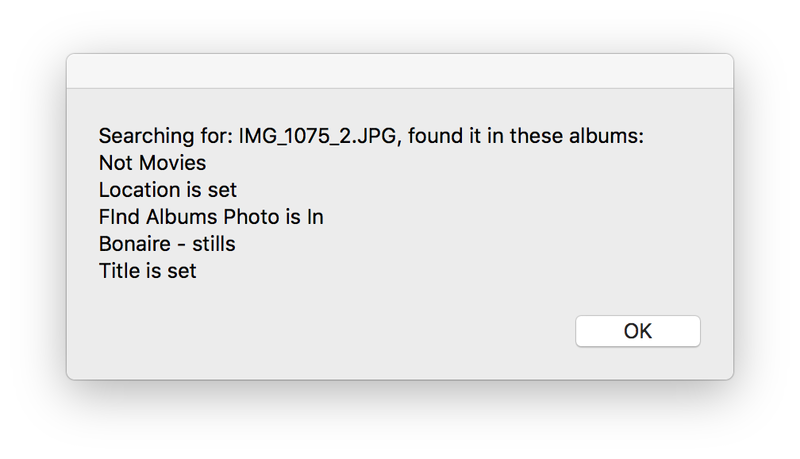 set resultcaption to "Searching for: "
set imagename to "unknown filename"
display dialog "Error: cannot get the image ID" & errNum & return & errText & "Trying again"
display dialog "Error: cannot get the albums" & errNum & return & errText & "Trying again"
set t to "No album"
I don’t use Photos, but why shouldn’t/couldn’t it work just as in Contacts? Click on a contact (or photo) and see which groups (albums) light up in a list. While that’d be great in theory, I think the problem would be one of scale: In Contacts, I have a handful of groups. In Photos, I have over 150 albums. That’d make for a lot of scrolling and opening/closing folders to see the highlighted locations.